Henri Pierre is one of Canada’s newest IFBB pros, but unlike many, he didn’t have a very lengthy history with training or competing. Henri first began training at the age of 26, right after he quit playing College AAA basketball. It was during his time in the gym that Henri knew this was where he belonged. “Right away I got bitten by that bug … I did my first show in 2007, a regional, and I won it all!” After competing in the Natural stream for several years, Henri decided to change over to the Open stream with the help and support of fellow IFBB pro Larry Vinette. It was decided at that time to compete at the Nationals in 2012. With a Top 10 finish, Henri, along with his mentor and coach Larry Vinette, worked on bringing a better package for the following year. The results proved that the hard work put in was worth it. 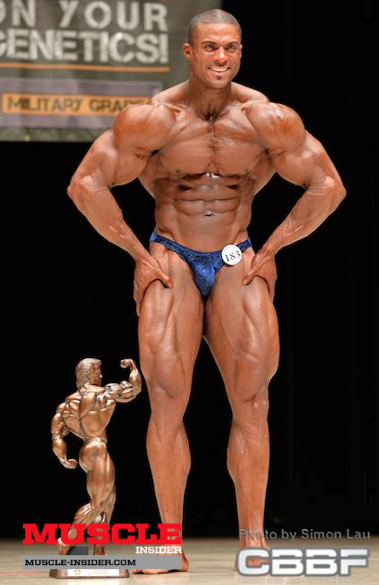 In July 2013, Henri Pierre won it all and earned his IFBB pro card.